Illustration from Expedition Austin: A Kid’s Guide to the Weirdest Town in Texas created by the lovely Virginia Shurgar Hassell. There are lots of opinions about the adage “Write what you know.” Some think you should. Some think you shouldn’t. Some think it depends on what you mean by “what you know.” Personally, if you’re wondering, I think you should write what you know, otherwise you are just contributing to the confusion in the world, and that is a very, VERY bad thing for a writer to do. BUT, part of the fun of being a writer is learning about new things and then writing about them. Which is basically writing what you know even if the thing you now know you didn’t know yesterday. In a business story for Southwest magazine, I got to highlight local hamburger joint P. Terry’s as a great example of how a culture of generosity can pay off in the long run. In a travel guide for Design*Sponge (a web site I love), I got to talk about all of my favorite places. In a Q&A for Austin Monthly, I got to interview Wes Hurt, one of the cofounders of Hey Cupcake! who has pretty much been through it all and rallied to get on with life and start another cool business called Clean Cause. 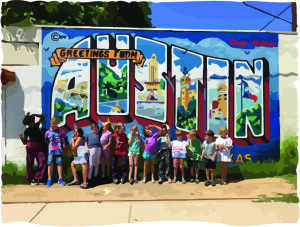 In this opinion piece for Giving City Austin about how travel can make kids more empathetic, I not only got to research that fascinating subject; I got to shine some light on a few neat Austin nonprofits. And, here’s one more for Southwest magazine about productivity in which I highlight Austinite Monica Maldonado Williams because, to the rest of us, her output appears to be superhuman. In just a week or so, Expedition Austin: A Kid’s Guide to the Weirdest Town in Texas will be hitting the shelves, literally and virtually. While I stopped tallying the number of hours I spent researching the kid centric part of my town long ago, I can safely say I wrote about what I know, and loved every minute of it.